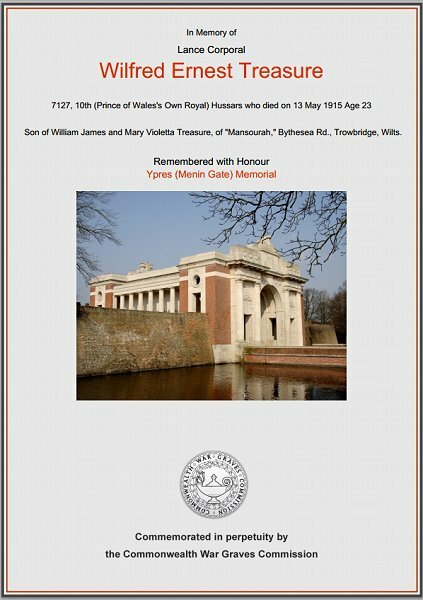 Wilfred Ernest Treasure was born in Yeovil on 14 November 1891, youngest of the four sons of Yeovil-born Railway Inspector William James Treasure (1859-1935) and Mary Violetta née West (1860-1935), originally from Whiteparish, Hampshire. In fact William and Mary had spent very little time in Yeovil; their three eldest sons - Ralph (b 1885), Sydney (b 1886) and Edward (b 1888) - had all been born in Sparkford and by the time of the 1901 census the family had moved to Westbury, Wiltshire. By 1911 Wilfred had left home but I couldn't trace him in the records. This is most likely because Wilfred enlisted in the 10th Royal Hussars (Prince of Wales' Own) at Taunton, although at the time he was living at Trowbridge, Wiltshire, with his parents. It is not known when he enlisted, but his Service Number 7127 would suggest around 1910 or 1911 and consequently he would have served on the North-West Frontier on the Pakistan / Afghanistan border region for several years. In 1914, the regiment was recalled to England and quickly dispatched to France as part of the British Expeditionary Force, in 3rd Cavalry Division. Whilst it did not see a great deal of action as cavalry, it provided one company of men for an infantry battalion, which served in the front lines. The Second Battle of Ypres, 22 April-25 May 1915, was a rare German offensive on the Western Front during 1915. It was launched with two aims in mind. The first was to distract attention from the movement of German troops to the eastern front in preparation for the campaign that would lead to the victory of Gorlice-Tarnow. The second was to assess the impact of poisoned gas on the western front. Gas had already been used on the eastern front, at Bolimov (3 January 1915), but the tear gas used there had frozen in the extreme cold. At Ypres the Germans used the first lethal gas of the war, chlorine. The gas was to be released from 6,000 cylinders and would rely on the wind to blow it over the allied trenches. This method of delivery controlled the timing of the attack – the prevailing winds on the western front came from the west, so the Germans had to wait for a suitable wind from the east to launch their attack. The line around Ypres was held by French, Canadian and British troops. The attack on 22 April hit the French lines worst and, not surprisingly, the line broke under the impact of this deadly new weapon. The gas created a gap 8,000 yards long in the Allied lines north of Ypres. The success of their gas had surprised the Germans who didn’t have the reserves to quickly exploit the unexpected breakthrough, allowing enough time to plug the gap with newly arrived Canadian troops. During the battle the British, French and Canadians suffered 60,000 casualties, the Germans only 35,000.However, Lance-Corporal Wilfred Treasure was killed in action on 13 May 1915. He was aged just 23. Wilfred is commemorated on the Ypres (Menin Gate) Memorial. His name was added to the War Memorial in the Borough in 2018. The Commonwealth War Graves Commission certificate in memory of Wilfred Treasure.